Toilets will likely be a major luxury when SHTF. Thankfully you can make your own with the use of a 5 gallon bucket and a few other supplies. First take a clean, large trash bag and put it inside the bucket. Tie it off on the outside so it stays in place. Next take a pool noodle and hollow out the middle. Wrap it around the rim of the bucket, with the hollowed-out portion touching the rim (this will be the toilet seat). Now just place a roll of toilet paper over the handle of the bucket, and you’ve got a makeshift portable toilet you can use just about anywhere. Composting toilets are great for transforming our waste into usable material for agriculture. And with a little bit of effort you can build one yourself with just a few materials (plus a 5 gallon bucket)! Survival gardens can really come in handy when you’re adding to your survival food stockpile. And when you plant a garden in a 5-gallon bucket, it becomes a portable container of on-the-go produce! Make sure to drill small holes at the bottom of the bucket to help prevent overwatering. Here’s a cool gardening hack. Certain plants (namely tomatoes) do really well in hanging gardens. And, since 5-gallon buckets are made out of thick, durable plastic it helps extend the life of your planter tremendously. Check out the video below to learn all about how to transform your bucket into a hanging tomato garden. Using simple 5-gallon buckets you can make your own DIY aquaponics system! These buckets will hold the fish and the pipes for transporting water. They’ve also got lots of space to hold a variety of space. If you’ve got a 5-gallon bucket with a handle and a lid, you can use it as portable storage space for your essentials. Store items that shouldn’t be out in heat, moisture or sunlight. Want easy access to game? Use a 5-gallon bucket (and a few extra materials) to make a DIY deer feeder. Watch the video below to see how it’s done! If your bug-out bag falls apart, you’ll need a way to transport your stuff. 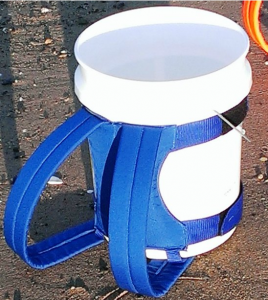 Well, with a 5-gallon bucket and a little ingenuity you can make your very own backpack! Here’s a visual to get your creative juices flowing. Worms are incredibly helpful when making compost. And, in turn, great compost is going to give your plants an incredibly rich boost of nutrients that’ll help them (and you) thrive! Here’s a video showing you the process. If the heat’s getting you down in a crisis, you can transform your 5-gallon bucket into a DIY air conditioner! All you need is the bucket, a utility knife, a gallon-size jug of frozen water, some PVC pipe, a styrofoam minnow bucket, a portable fan, and a hole saw. This one features a similar process as the A/C unit above. Instead, you’ll utilize a swamp cooler pad (rather than the frozen jug of water) to help cool the air down. See the video below to see how to make it. Good news! By using a 5-gallon bucket and the power of the sun, you can heat up water in a survival situation. Simply paint the entire bucket (with lid) black. Then fill it with clean water and leave it out to heat up in the sunshine. You can also insulate the bucket to help keep the bucket hot for longer periods of time. Chickens are fantastic animals for a survival situation (you can see why they’re the #1 survival animal right here). And, if you make a chicken feeder out of your 5-gallon bucket, you’ll minimize the time you have to go out and feed them. Check out the video below to see how this nifty invention works. Here’s a great method to use when you’ve got a white 5-gallon bucket. Simply drill a hole in the bottom of the bucket, and stick a flashlight (light side up) or emergency candle (wick-side up) into the hole so it stands up on its own. 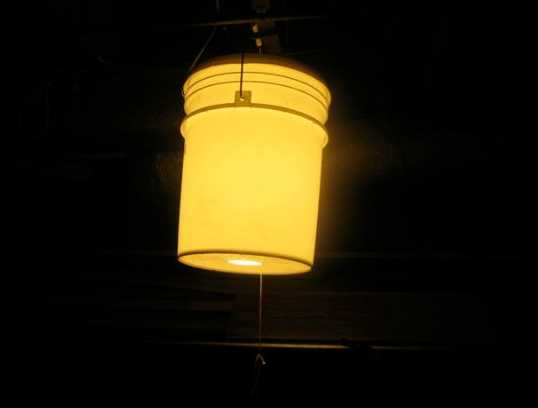 Line the bottom of the bucket with sand or dirt to help prevent the light source from falling over. Then turn on the flashlight or light the candle, put the lid on the bucket, and presto! You’ve got a lantern to help you see in the dark. Here’s an ingenious survival hack. If you need to wash your clothes, you can transform an ordinary 5-gallon bucket into a washing machine! We wrote a survival article showing you all about how to make this work. Check it out right here.